A relatively new sign in the Stroudwater Village area of Portland. Some day I will have to get some photos of the local goose population that gathers in this area. I didn't realize the geese -- and the sign -- had returned (and I realize this was an old post)! For the most part, I thought the geese had been relocated when Congress St. was expanded to 4 lanes. Hopefully the historic protocol -- you stop your car and let the geese cross -- wasn't lost to memory when the goslings were there. Thanks for the comment, Mark. 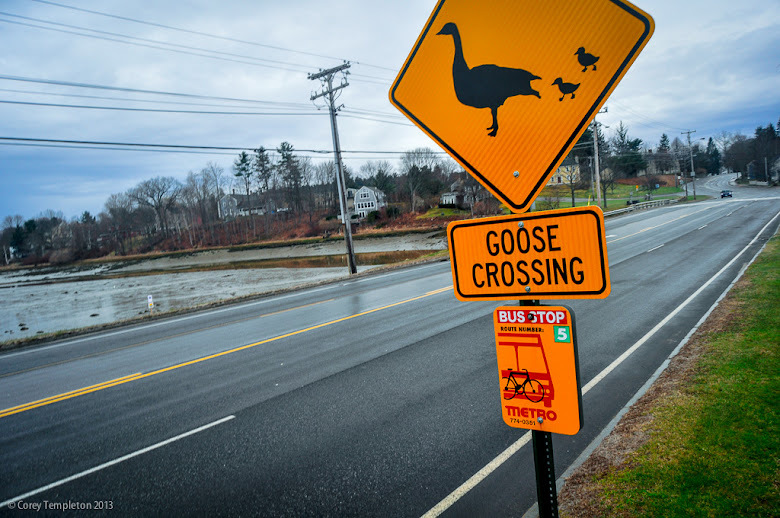 I still see the geese occasionally around here on the ocean-side of the road, I live downtown and commute via bike and/or bus to Unum for work. I've never actually seen them in the road or trying to cross it though. Hopefully the signs catch the attention of some motorists.